Sometimes I feel like I write with such vagueness. I try to give as solid advice as I can, and to share as specifically as I'm able to what I've learned about unschooling by doing it. But when I look back at a lot of what I've written, sometimes I find myself thinking well yeah, what I'm saying is the truth as I see it, but is it specific enough to actually be helpful? I'm guessing it is or people wouldn't read and like it, but sometimes I look at some of the other blogs out there, and admire how much they talk about Goals! And 10 steps to doing better at things! And so much detailed advice! That envy never lasts though. Because when you're writing about unschooling, how can you say this is how you do it, no matter what specific "it" you're talking about? I can share what's worked in my own life, how I've approached learning myself, and that can be interesting and helpful for others, just as my reading about the experiences of others "uncolleging" can be helpful for me right now. But beyond that, unschooling is kind of all about figuring things out for yourself. As many ideas and resources and advice as I, or anyone else, shares, as much expertise on unschooling/life learning/uncollegeing and beyond any person claims to have or not have, ultimately it's just a vision of the possibilities available to you and your family. If we're to recognize how different each person (and each family and each community) is, we have to quickly realize that the more specific we get in talking about the how's, the less people are likely to find that actually works for them. So I guess I'll just continue writing vaguely, or just talking about the very specific ways that have worked for me, personally. 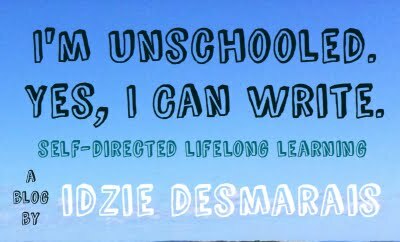 Because anything else, though it might make a more impressive post on occasion, just doesn't do justice to the truly personalized personalized journey that is unschooling. As mentioned in my year in review post, I've been working on a personal website, a site where I can gather together all my projects, blogs, and main interests, making it easier for people to find my stuff as well as making my online presence feel more organized and cohesive. After some difficulties with the more technical aspects (I am not exactly good at computer-related technical anything), I finally got everything sorted out, and my site went live last week! Check it out. There are some features missing if you don't pay a monthly fee to upgrade, but Weebly still impressed me with the available free features, ease-of-use, and slick look. I actually enjoyed putting the site together for the most part, instead of struggling as would usually be the case. This new site also gave me the opportunity to start a personal blog, as a place for all the writing I do that doesn't seem to fit on any of my other blogs, either because of its more personal nature, the subject matter, or that it's just too half-thought-out. I especially felt a need for such a blog since I'm pushing myself in this new year to write a lot more, and so far I'm written more in a month than I did in six months last year! 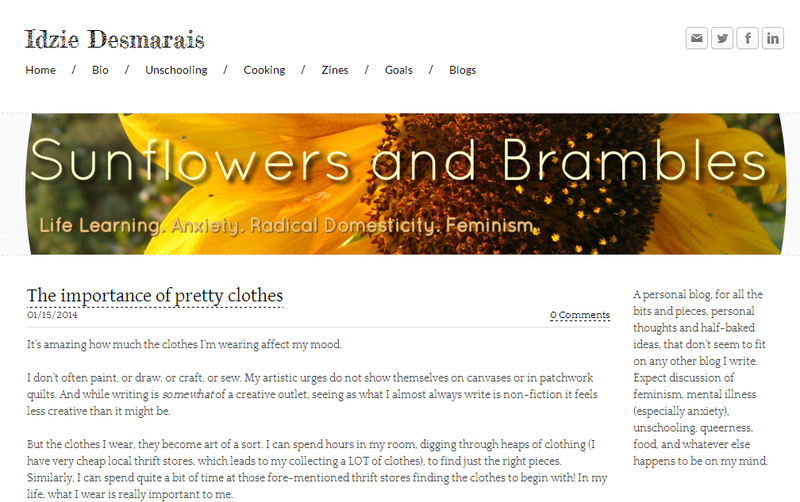 The new blog is Sunflowers & Brambles, and some things I have been or will be writing about there is anxiety, life learning, feminism, and radical domesticity. I'm excited about finally having my own site, and if you decide to take a look at it, feedback is much appreciated! Mostly what I write is aimed at unschoolers themselves (unschooling parents, teens, and grown unschoolers), and potential unschoolers/those new to unschooling. But what about the people for whom unschooling, as in the practice of not going to elementary or high school and instead learning from life, is no longer an option, just because they’ve already finished with high school (sometimes quite a while ago)? For the schooled adults who discover unschooling and love what they see, and want to know how they can incorporate the ideas/ideals of unschooling into their own lives, this is the post for you. Not being a schooled adult, I can’t swear this is the best advice for someone who was, but here are some things I think have the potential to make a difference in the way people approach learning in their own lives. Let go of any ideas you have about what the structure of learning is supposed to look like. If you genuinely thrive on learning in a really structured and organized way, then go ahead and create your ideal curriculum, complete with scheduled study time for the next few months. But you can also just pick up a few books from the library to read whenever you feel like it, or spend time googling a subject in free moments between other commitments, or drop in to a local music jam whenever you want some help practicing. Learning can be as rigorous and structured or as relaxed and casual as you wish to make it. Learning doesn’t have to be pursued in a way that looks like school for it to be worthwhile. after wanting to play for many years. Learning by myself isn't going as well as I'd hoped! There are times when unschoolers face the pressure to perform well, for sure: auditions and job interviews and university entrance exams. But for the most part, the meat of learning is done without someone looking critically over your shoulder, without the looming presence of quizzes and exams. Learning can be strictly for you, simply because you want to learn. Take a deep breath. Relax. Learning for the sake of learning can be really fun and exciting and rewarding. There’s no end date to learning. There’s a reason that quote has lived at the top of my blog for years. Its message resonates with me, and reminds me that it’s never too late to learn something. You’re not too old to learn X instrument, or to decide to memorize the times tables, or learn anything else that you’re “supposed” to learn young. For as long as you’re alive, you can keep on learning any damn thing you want to. All of these are important things to remember, for schooled people and unschoolers alike (I can get caught up in other peoples' expectations of what learning is, too). But the "secret," if there is one, comes down to just working on eroding the imaginary line between living and learning. Life learning is what it's all about. What is your advice for adults wanting to incorporate unschooling ideals into their lives? What have you felt was helpful in your own life?